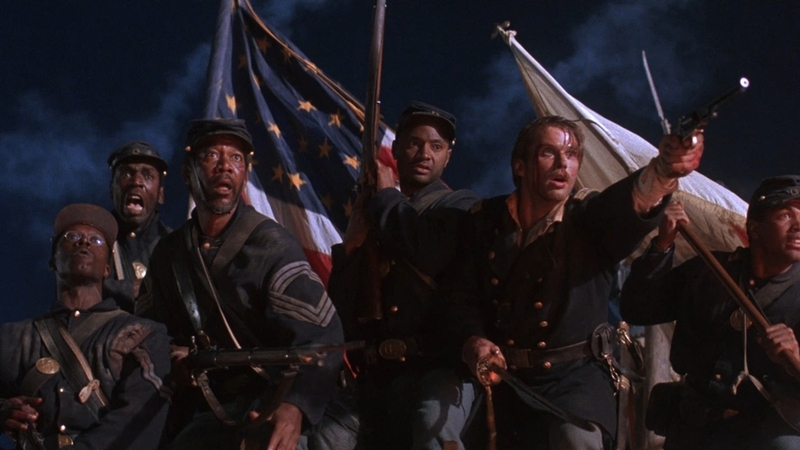 GLORY In 1863, white officers lead a regiment (the 54th Massachusetts) of Free blacks and ex-slaves into action against the Confederacy. A surging, rousing, glorious true story, this might be the best movie about the American Civil War (if you shoulder ‘GWTW‘ aside as a romance instead of a war story). 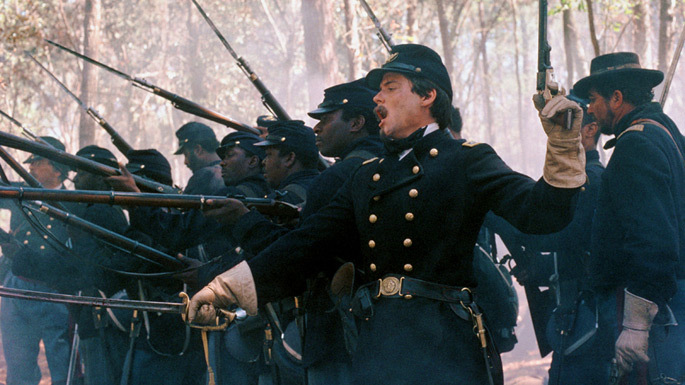 Gettysburg, very good, is bigger, and even more authentic, but Glory has an emotional resonance that surpasses it and other movies about the conflict. There are few, as the subject was traditionally poison at the till, even though (or maybe because of) the bone-deep national trauma produced by the war would seem made for a wide audience—look at the horde of WW2 films. But the stories of 1941-45 involved everyone pulling together, while the sagas of 1861-65 had everyone pulling apart. That whirlwind from seven generations back lingers yet, often in ways that make you wonder if all the sacrifice accomplished anything. Well, of course it did, and director Edward Zwick’s salute to the people who had the most to gain and everything to lose from the conflagration will get your patriotic blood flowing to a lake of pride that hasn’t been visited much, without any fake conviction, since, well…? 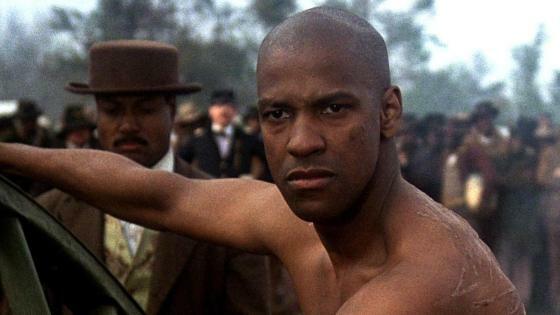 This highly praised battle epic nabbed three Oscars–Supporting Actor (Denzel Washington–marvelous), Cinematography (vivid and immediate,from Freddie Francis), and Sound. The Art Direction and splendid Film Editing were nominated. Whole cast is top flight. Matthew Broderick at first might seem a tad callow to be leading men into volleys, but a great many of those gallant soldiers were after all scarce twenty. Cary Elwes makes a solid impression as Broderick’s doubt-racked second in command. Morgan Freeman (perfect), Andre Braugher and Jihmi Kennedy fill out the ranks. Washington gets the showiest role, and he fairly commands the screen. 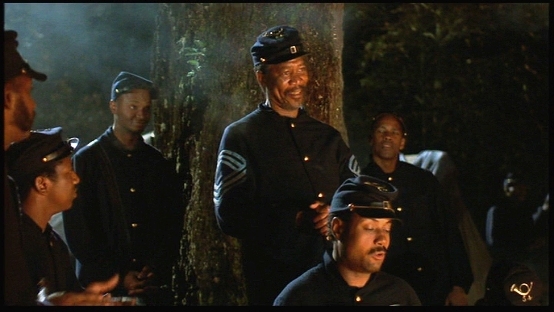 Haunting score from James Horner makes use of The Boys Choir of Harlem. Three stunning battle sequences bring you front and center into the horrid marvel of men charging into near-certain death. First is a slice of the battle of Antietam, still the bloodiest day in the nations history–and lets cross fingers it keeps the record. Second is a wild hand-to-hand melee. Last is the climactic are-you-kidding? 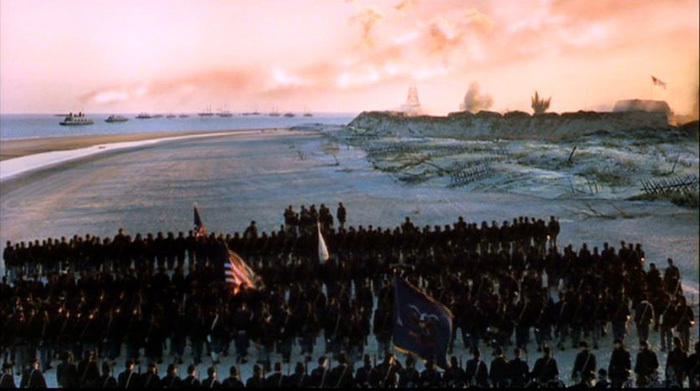 beach assault on Fort Wagner, one of the most gripping combat scenes of its time (Horner weaves “Carmina Burana” into the score here, thrillingly). Driving Miss Daisy took the statue for Best Picture for 1989–this is much more deserving. With John Finn, Cliff De Young, Bob Gunton, Jane Alexander, Raymond St.Jacques and Kevin Jarre (who wrote the excellent script). It plays out over 122 minutes. Tight movie, tight review. Just viewed this again, for the third time, and find that I appreciate it more in each ensuing decade. Articulates the cause of that war better than anything I have seen; watching Denzel speak to Matthew Broderick about his own future prospects after the war is over, I am inclined to wish we would have held those who made a mockery of ‘states rights’ tightly in Reconstruction fully until, well, they were actually reconstructed. Washington is amazing, of course, as are also Andre Braugher and Broderick as young men of privilege growing up on the spot.